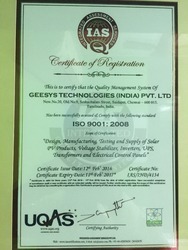 Discovering ever new heights of excellence has been a passion for Geesys Technologies(India) Pvt Ltd since 2011. We are a Private Limited Company. By offering an excellent range of products, we have become a name synonymous with perfection. Our credibility as a manufacturer, wholesaler, supplier and trader is cemented as we offer quality products. We provide world-class and high quality electronic products. We are indulged in offering Security System, Charge Controller, Power UPS, Voltage Stabilizer, Power Inverter and more. Additionally, we also render EPC Contracting Service, Solar Panel AMC Service and more. The reason for such a systematic growth is our unwavering commitment to adopt leading-edge manufacturing technologies. Founded at Chennai, we have left a mark of prominence owing to our hard work. Further, we have customer friendly business policies, which enable us to earn respect from the clients. We offer a wide range of products and services in the industrial, commercial and consumer markets through our innovative technologies. We are one of the fastest growing firms in the market. Our team has the combined strength of about years of experience in electrical power and electronics industries. Since the existence of the company, we are supported by a sound and modernized infrastructure unit. The unit is well-furnished with latest technologies and tools that enable us to manufacture superior quality products. GEESYS is comprised of forward-thinking technology experts capable of creating integrated solutions that best address the needs of our customers. We are able to anticipate global trends and continue to win business as a result of our outstanding management and planning process. To be the world’s leading Electrical and Electronics Engineering company and services provider to satisfy our customers. We help our customers to use electrical power efficiently, to secure from hazardous, to increase industrial productivity and to lower environmental impact in a sustainable way. To provide the highest quality products and services satisfying the customer's needs, while creating an employee environment for prosperity, professionalism, Innovation and opportunities for success. Nothing is more important to GEESYS's overall success as an enterprise than our ethical values. Our shared regard for the highest standards of honesty and integrity is our biggest strength. GEESYS takes pride in the people who make up our team. From our senior management officers to our line production workers, we seek to conduct ourselves in a way that demonstrates uncompromising ethical standards with customers, suppliers, governments, the public, and each other. We understand that we must be guided by our shared ethical values because to do otherwise puts each of us, as well as our entire enterprise and all the value it generates, at risk. We also practice corporate social responsibility. GEESYS a major emphasis on corporate philanthropy, employee volunteerism, and environmental stewardship. "Our policies and practices require our employees to conduct business lawfully and ethically wherever we operate"
The Global Ethics and Compliance Office is responsible for providing employees with the information, tools, guidance, training and support they need to comply with the Code of Ethics when making day-to-day business decisions. This office provides effective ethics education, training programs and communications designed to ensure that GEESYS's ethics and values are integrated into its business practices on a consistent basis around the world.